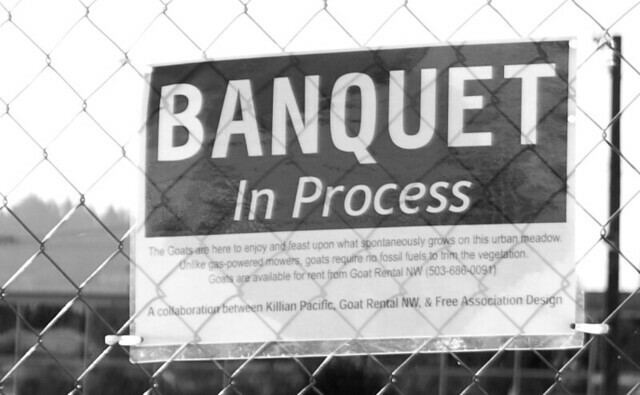 A collaboration between Killian Pacific, Goat Rental NW, & Free Associate Design. I thought this was pretty cool, and judging from the crowds I always see watching the goats at work, I'm not the only one! LOVE IT! Now THAT's using your noodle. Now I want a little plot of land even more! A little bit o' country in the city. I love it. Did you see that you wrote Gree Associate Design but the sign says Free Association Design? I just wondered if there was something to that. Are they planning a garden for this area? This is so cool! I love visiting the goats here on the local organic farm. They have so much personality. What a great idea! The goats are so cute, I live in Sacramento and they use cows for the same purpose. Violet: I know...they are so funny and endearing! Kristi: That's great...I can only imagine seeing cows in the city! What a fabulous alternative. I think it was The Colbert Report that did a spoof on this topic not that long ago. It's a wonderful idea. They could have gotten cows too. Goats for rental? I think the service should be free. After all, the goats get fed. :) Enjoy your post. Goat rental - what a fabulous idea! I wonder if they do it in the UK. And fabulous photos too. Cool! A few years ago, we went to a gathering with the folks my husband works with. The family lives on a lake. They took us in their boat to see an island, where their homeowner association had paid a guy to have his goats come keep the weeds down for a summer. I took some photos with my camera phone. greet your strip. You may level be it rid to a divergent website.website When you are in luck. or to recognise that their insides are pretender.